Personal Insights Only Your Best Friend Would Tell You! Have you ever wondered, "why did they do that?" Dr. Mels Carbonell's book, "How To Solve The People Puzzle" is a must for everyone who wants to understand why people do what they do. 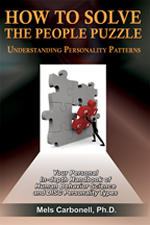 This book will then help you interpret and apply your results for personal development, more effective leadership, improved relationships, and many in-depth insights about you and others. Table of Contents Chapter 1:The Four DISC Personality Types Chapter 2: Your Personality - Graph 1 "This is expected of me!" Perspective Chapter 3: Your Personality - Graph 2 "This is me!" Perspective Chapter 4: When Both Graphs Are Generally The Same or Different Chapter 5: High Type on Graph 1 and Low Type on Graph 2 Chapter 6: Low Type on Graph 1 and High Type on Graph 2 Chapter 7: How To Handle Problems From A Personality Perspective Chapter 8: Case Studies and Examples Chapter 9: Final Word *Note this ebook does not come with a free code. No refunds allowed on this item.